Planning a trip can be pretty stressful. With so much information available thanks to the internet, it can be an overwhelming and daunting task. Figuring out which activities are a must, what can you skip if time is limited and what to bring for each activity to be prepared can make you want to tear your hair out. If you are traveling with your family, you know that a lot of preparation and planning needs to be done long before you depart for your trip. It can certainly add an extra element of complication and stress. That’s not how a vacation should be! To help you out with your planning, here are 5 family friendly Big Island activities for you and your family to enjoy. Lava Tree State Park is pretty unique and is one sight to see that should be included on your itinerary. Lava Tree State Park is 17 acres of a forest made of lava. 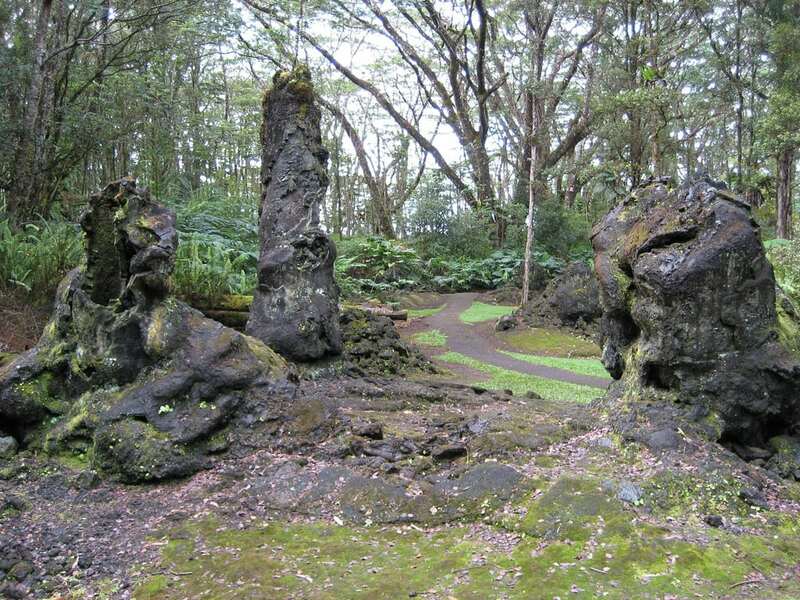 The lava forest was created after lava flowed through a forested area leaving behind lava molds of tree trunks. Take a hike on the .7 mile loop trail for an excellent viewing experience. Pack a picnic lunch and enjoy amidst the lava formations. Best of all, the park does not have any entrance fees, so you and your family can experience the amazing wonders of nature without having to break out your wallet. Get more info here. Located in Hilo, Hawaii, Rainbow Falls are an incredible sight to see. Accessible from Wailuku River State Park, the falls derived from the Wailuku River are blanketed by a lush tropical rainforest. The falls flow directly over a lava cave which is believed to be the home of Hina, an ancient Hawaiian goddess. And if that wasn’t cool enough to explore, when the sun shines just right, the falls are known to create beautiful rainbow colors among the mist created by the gushing water. This is perfect for your list of family friendly Big Island activities. Learn more about Rainbow Falls here. Located inside of Hawaii Volcanoes National Park, the Jaggar Museum and Overlook is all about the science of volcanoes. The museum exhibits displays that include lava, real-time monitoring of volcanic conditions and the equipment used to study volcanoes. Just as interesting as the science, the museum also includes exhibits that display the Hawaiian culture as it relates to volcanoes. Here you can learn about Pelehonuamea, the Hawaiian goddess of volcanoes. Learning about geology and culture in the same place is pretty amazing. Stop by the Jaggar Overlook just outside of the museum to experience breath taking views of Kilauea Caldera. This panoramic view gives you an incredible perspective of the geology before you. Number four on our list of family friendly Big Island activities is Akaka Falls State Park. Eleven miles from Hilo, Akaka Falls State Park is perfect for the family that loves nature. Take a walk through the lush vegetation and see the scenic vista points the overlook the Kahuna Falls and the Akaka Falls. At 442 feet high, the cascading Akaka Falls will blow you away. Take the easy to follow .4 mile loop under the canopy of the rainforest for stunning viewpoints of both amazing waterfalls. Of course while in Hawaii with the family, visiting a beach or two is a must! Magic Sands Beach is one to put on your list. The beautiful white sand that makes up this incredible beach is considered magic because it “disappears” from time to time as storms pass through the area. Washed out by such storms, the sand manages to find a way back to the beach over time. In the Hawaiian language, this beach is known as “La’aloa Bay” which translates to “very sacred”. This is partly because of its magic-like qualities. Magic Sands Beach is another great place to experience the fantastic Hawaiian culture while enjoying a day at the beautiful beach.